This baked trout is absolutely delicious, and couldn’t be easier. Trout is high in omega 3 fatty acids, and low in mercury, which makes is a great choice. Preheat the oven to 425°F (220°C). 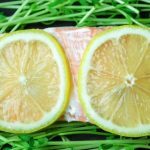 In a piece of foils wrap the trout skin side down with the rosemary, thyme, and slices of lemon. Bake in the oven for 15 minutes, or until the fish is cooked through and fork tender. This recipe is great for cooking over a camp fire if you’re out car camping. Prep the fish at home in each individual pouch as listed above (I recommend double wrapping the fish in foil). Keep on ice until ready to cook. Once your fire has been established, and there is a good amount of embers, place the sacks of fish amongst the hot coals. Cook for about 10 minutes, or until the fish is tender and flaky.